Peppijna Dalli in action in the pole vault event at Marsa. In athletics it’s not often that there is local mention about the pole vault. Indeed, albeit with the presence of a specialised coach, youngsters willing to take up this sport are few and far between, perhaps not encouraged by parents witnessing their off-spring scaling the heights. Not so for Peppijna Dalli, the latest prodigy enthusing her coach Jivko Jetchev – and her father one hastens to add. 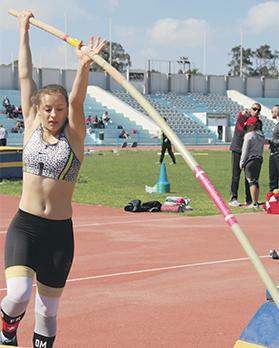 Having had her fill of competitive exposure in gymnastics for the national team, Dalli was encouraged by Maltese Olympic Committee director David Azzopardi to seek service from Jetchev who is gradually moulding her into a potential medal winner. Perhaps, 2017 could be her breakthrough year, for within the space of eight days she bettered the national record for this event on two occasions, with the height to beat now set at 3.40 metres. As if these records weren’t enough, another of Jetchev’s athletes – Daniel Saliba – is laying siege to another discipline which is so lacking in popularity among locals. Within the same eight-day period Saliba broke the national record twice for the 400m hurdles, his most recent best time to complete the circuit now lowered to 55.90 seconds. Like Dalli, Saliba is setting his sights on the summer events, with the GSSE followed by the European Championships proving to be the driving inspiration. Had this been all to cheer about, Pembroke Athleta and local enthusiasts would have been rightly justified. But at the first of the Challenge series, another member upped the national record on the field in yet another discipline – a javelin throw of 45.16 metres set by Joanne Vella. The new mark has made her eligible for selection for the GSSE in San Marino between May 29 and June 3. Which also brings to mention the qualifying time reached by yet another athlete from the Pembroke fold, this time over the 10,000m distance. Last Saturday, veteran Lisa Marie Bezzina stopped the clock on 37 minutes and 7.34 seconds.